"Hi Ksenia. I'm researching which way to go with self-publishing and am veering toward CreateSpace. [I heard] you use them with your books but that you are looking at Ingram for libraries and bookstores. I didn't realize that you could use both, but what I liked about Ingram is that they have access to the bookstores. Did you get your own ISBN #'s? I've read that is the way to go. I'd appreciate any guidance you can give me." Thank you for reaching out, Mandy. I suppose it's time I summarize my experience with both channels. It's been two months since I have pulled Rosehead and Irkadura from CreateSpace's expanded distribution channels and posted them on IngramSpark (Ingram's indie distribution arm). My books are now on Ingram! What does it mean? My books are on Ingram now! Hooray!!! Well, not all of my books, only Rosehead and Irkadura, and you will understand the significance of the image above shortly. So, what does this mean and why is this important? Many of you have asked for my books to be in libraries and in bookstores, but since I'm an indie, I had to figure out how to do it myself. So the first thing I did was I got extended distribution on CreateSpace. Several of you have requested my books in the libraries, and they have happily bought copies, and you sent me pictures! Yay!!! A bookstore I did a reading at sold my books! Double yay!!! I thought I was done. I've recently discovered an amazing number of self-publishing platforms and have sat down in horror, holding my head with both hands and staring at the wall, because instead of a simple choice of distributing my books everywhere (the plan was to post Siren Suicides for free, like, everywhere) I was suddenly faced with an impossible task of trying to decide where to do it, without knowing exactly what platform does what, and without having ample time to test each, to be sure. So, what I will do in this blog post is kind of run through the skinny on them all and some other curious practical things that I discovered by accident while posting Blue Sparrow for free everywhere, and then maybe will do a follow up post, to give you an idea of what's out there and what to expect, in case you're a self-publishing newbie like me. The book market break-down. Before we jump into the million gazillion of little guys, let's take a look at the entire ebook market, and, I mean, ebook market, because bookstores are largely not very accessible to self-publishing authors as we rely on folks like Amazon (if you bought extended distribution) or on the fact that your novel sells like crazy (cause then they're suddenly interested). Therefore I'm largely looking into distributing my ebooks everywhere first and foremost (I only sell paperbacks via Amazon and in my store right now). The numbers are very simple. About 50% goes to Amazon/Kindle, about 20% to Apple/iPad, about 20% to B&N/Nook, and the rest of the 10% is divided between smaller guys like Kobo and others. Now, these numbers might be off a bit as I simply did a quick and dirty Google search on the topic, but it sounds about right. According to this, your goal is to get on Amazon (a must), on iBookstore and Barnes & Noble (would be great), and maybe on smaller sites, if you have time. Now comes the interesting part, namely, how the hell do you do that? Amazon's KDP. Free. They're the big guys, so you want to be here. Smashwords. Free. They will distribute your books to Amazon, Apple, B&N, Kobo, etc. Lulu. Free/Paid. They will post to Amazon, Apple, and B&N. Nice interface. The rest of the little guys (some are not for novels but rather for short stories, some are not strictly for distribution, some are free, some paid, so check them out): BookTango, Ebookit!, BookBaby, Vook, PressBooks, Draft2Digital, Kobo, ReadMill, Scribd, WidBook, Rhovit, ReadWave, Libboo, Authorgraph, Lelivro, WattPad, Tablo Publishing. 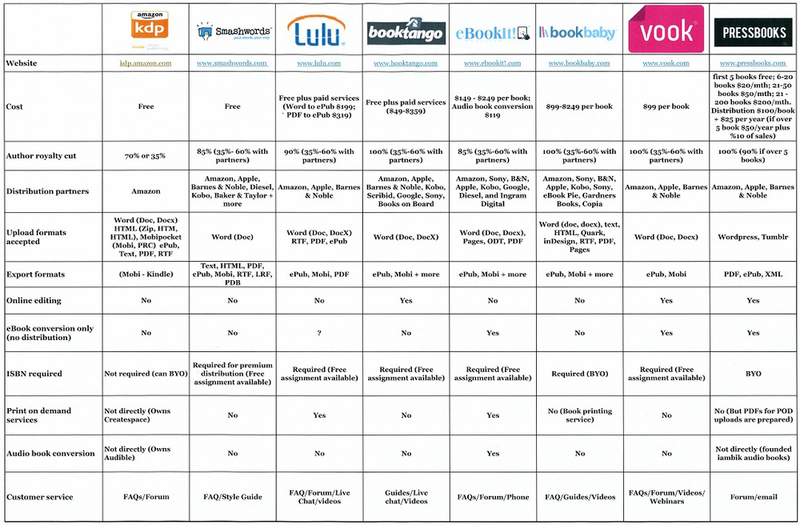 I came across this self-publishing platforms comparison chart by Ben Macklin from BWMBooks.com. Read here the entire article. So whom should you use? Well, the big guys, of course! Until a solid trustworthy contender emerges, Amazon rules. So far the only beautiful promise I have seen is Tablo Publishing, and that's why I want to work with them. They don't offer printing books yet, for example, but they will. My biggest struggle with CreateSpace is the quality of printed books, I want it to look a certain way, but I have no control, unless I use an expensive printing company. 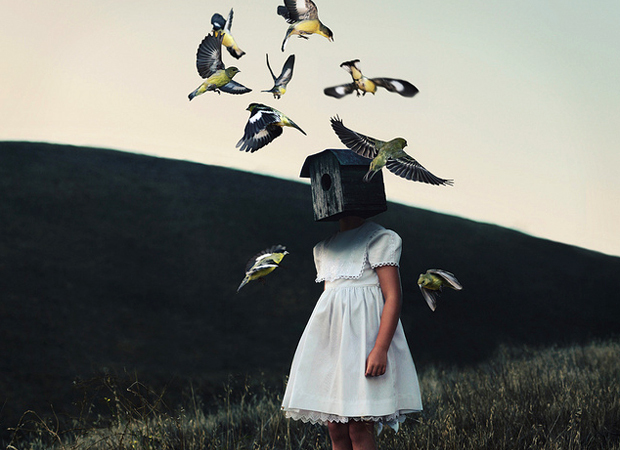 I will proceed posting Siren Suicides on most of the above mentioned sites and will let you know how it goes. For now my principle is very simple: to spend most of my time writing, and as I have time in the evenings, slowly post it everywhere. My thinking is, once I start cranking out stuff worth spreading, it will spread itself. Until then all I can do is, keep writing. I hope this gives you enough of an idea on how to navigate this crazy self-publishing maze, and at least gives you one place to which you can come back to, to check out links (I know I will be using this post for this purpose). If I've missed some self-publishing platform, please post it in the comments!